In this shot I was running about 20 mph as I went over this underground silo. Even at 20mph you can clearly see the depth of the depression [about 5 feet] on the sonar page. I keep my sensitivity up pretty high when I run which increases motor noise [all the vertical dashes] but that enables me to see bait and fish [and of the marks with color] better. In the structure shot on top you can see the silo clearly and with structure scan you can see the reflection of the concrete floor of the silo. The harder the object, the better it reflects the pings. The concrete is seen horizontally in the pic going out about 10 feet either side of the silo. With this color palette the harder the object the whiter the reflection on the structure page. On the sonar or echo screen the harder or denser the object the redder the return. 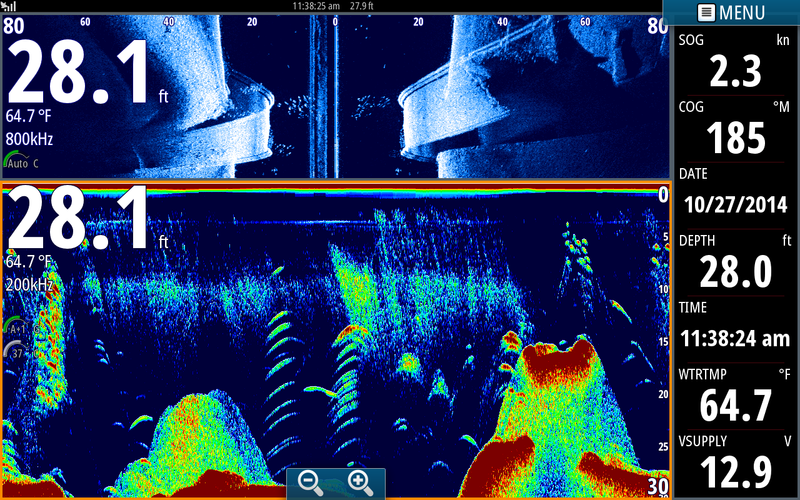 As I run using the sonar page the more color in a school of bait represents more density [baits grouping tighter] and the more color the fish have the denser or larger they are. I don't mind the motor noise, I see right through it. This is a picture of an old road bed. In the top Structure Scan screen most of the structure shows up pretty light. The hard road and rip rap stone reflect pings very well. Check out the detail of the guard rails on the sides of the road. Structure Scan leaves little to the imagination, it is crystal clear. This is a pic of the same roadbed at a slightly different angle. There is a lot of activity going on around the structure. In the sonar view as I approach the road on the left of the screen you can see a school of 4 to 6 inch Gizzards. About midway through the screen there are a couple stacks of Crappie then right at the edge of the road there are a couple Bass noised right against the road and railing. In the side scan shot notice how the the small schools of bait are relating to the edges of the structure just above the railings. Setting your side scan page up utilizing the entire width of the screen like I have it here lets you get the full benefit of Structure Scan technology. I have adjusted the splits in the screen so I can get the most out of both echo and structure. 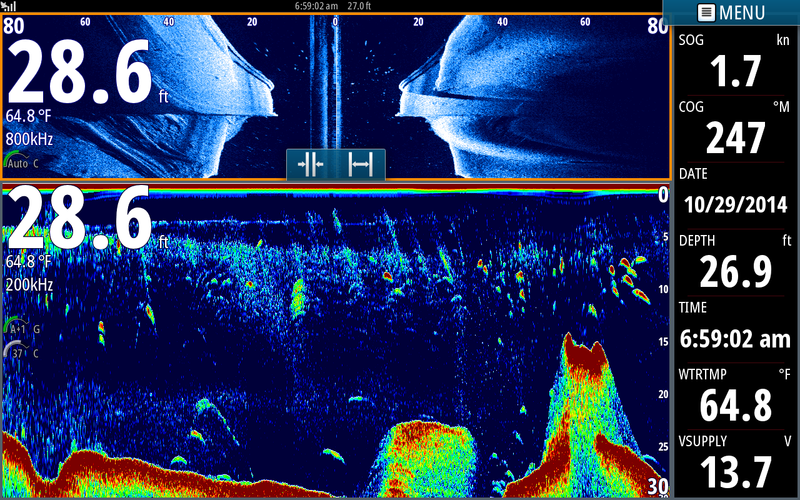 Fishing for Stripers I am more focused on the echo than the structure and having more sonar page showing allows me to see bait and fish better. Both Simrad and Lowrance have similar features letting you customize the appearance of your screen to meet your specific needs. 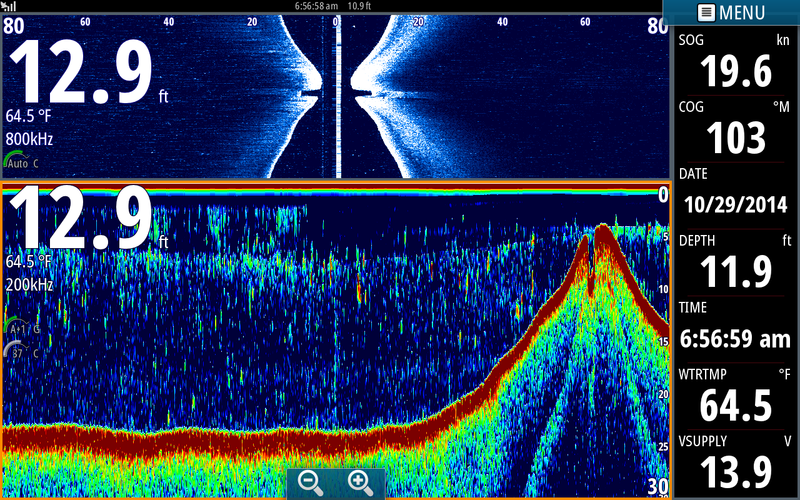 I have shown these structures in earlier posts using my Lowrance and since I get so many inquiries as to the difference of the two units I thought I would post these pics using my Simrad. Very interesting and informative. Thank you for sharing, Jim! Nolan I did not fish on Saturday but I had two guides out. They caught plenty of fish but mostly punks.